Happiness in the Making: Hair - Did. "Nah - he doesn't need one. That totally does not qualify as a rat tail or whatever the kids are calling them these days," my husband said, a rake full of dead leaves signaling the start of spring yard work. As with many things after nearly nine years of marriage, I disagreed. And promptly scheduled a same-day snip for the little guy. His first. Without Daddy knowing. 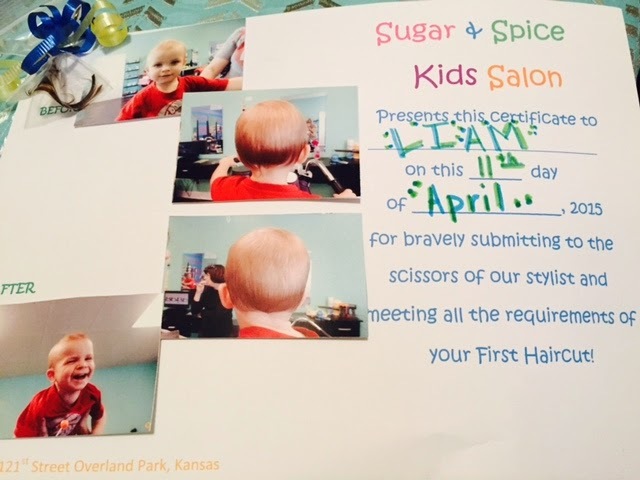 On the drive there we relished in the 70-something degree air, chanting cheers of encouragement and excitement over THE FIRST HAIRCUT. Brother may have gotten a few digs in there about how he'd punk out, but the promise of dum sums, Dora and a motorcycle quickly won over the two-year old psyche. Arriving 15 minutes early they were prepared: all chairs open, camera in hand and the most experienced stylist in the place. Anticipating the worst as many Moms of spirited toddlers do (shameful), I had provided backup (Nana), bribes and threats. Instead, I found myself delighted as he picked the purple motorcycle, shouted words of "WHOA" at the movie "Cars," and every once in awhile mustered an death glare and palm brush of the kind gal working diligently at the crown of this head. And just like that, he was done. Happy first haircut little buddy. Looks good on ya.